People around the world believe that four-leaf clover is a symbol of incredible luck and if a man accidentally finds a four-leaf clover will be happy and rich. The history of this amulet begins at the dawn of civilization. They say that Eve took a souvenir four-leaf clover when she was expelled from the Garden of Eden. Since then, four-leaf clovers, has always been a faithful companion of man and is considered a powerful protective talisman and amulet that brings good luck, hope, faith and love. In today's online society, it is believed that if someone accidentally see a picture of a four-leaf clover while surfing online, it will bring him luck. 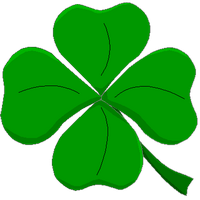 If you are reading this, It's your lucky day, it is enough to click on the four-leaved clover and see what your luck will be.